A few days ago I headed out to explore a road I’d never been down before. It’s less than fifteen minutes from where I live and in my current work-in-progress on the history of the West Fork valley, the road is mentioned often. I thought I should see it. I was not prepared for what I found there. Winn Creek Road. Named after the creek and Zadock Winn, a man who drowned there back in the early days of settlement. Other Winns established homesteads up that valley, too, and maybe the road took that name before Zadock drowned back in 1852. The road veers off southwest from Woolsey Road south of West Fork amid wide flat pastures framed on either side by steep, thickly-wooded hillsides. 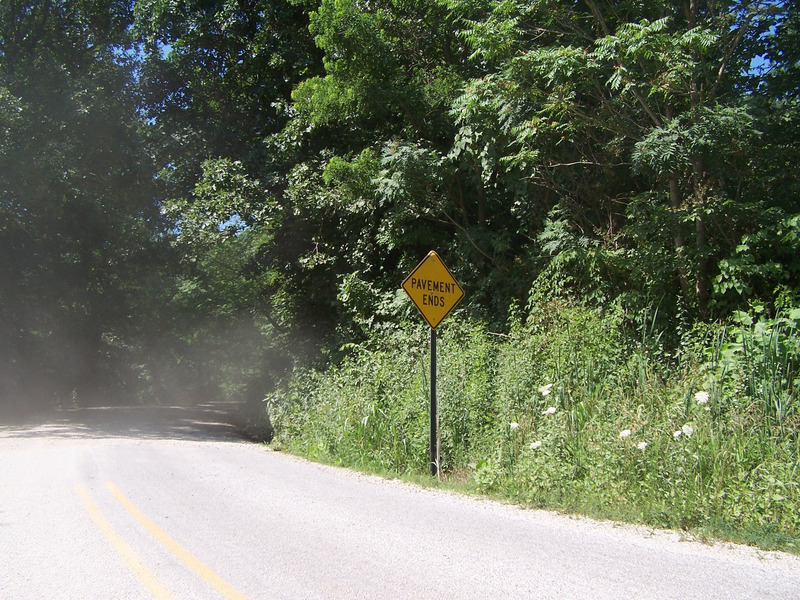 You know you’re getting to the good part when you see the “Pavement Ends” sign. The road narrows. You slow down as tires hit the gravel and a cloud of dust rises behind you. The valley attenuates to its essential elements and tree canopy encloses the roadway in welcome shade. 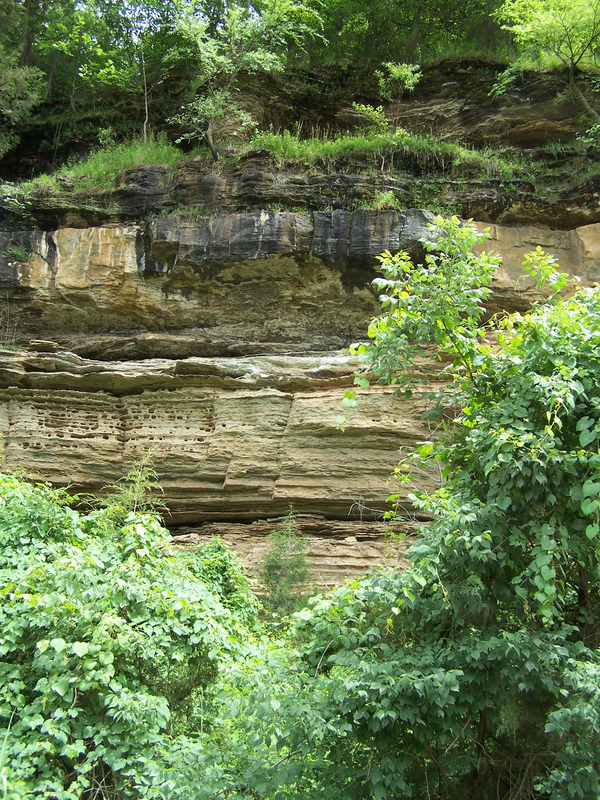 To the right, the hillside rises sharply, its massive rock outcroppings mostly hidden in dense undergrowth and hardwood forest. I imagine how it must have looked to the first man to blaze this path, hacking his way through brambles and vines. 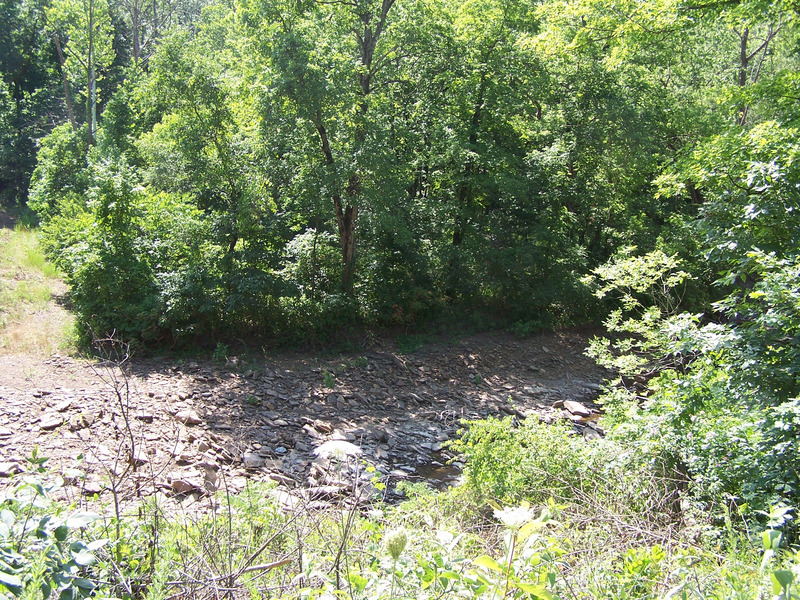 I imagine how he eagerly awaited the next curve of the creek as it curled through the 30-foot deep ravine to the left, perhaps thirsty, perhaps eager to splash water on his sweaty neck. Creeks were the roads before roads, paths cleared by regular torrents where in times of low water, man or beast could walk without fear of ambush by tick or cougar. Infinite generations of rocks large and small line the creek bottom. Pale brown, gray, occasionally black where the roaring water has undercut shale, limestone and sandstone claim the greater share of the lithic congregation. I pass a few houses, some buried on deeply wooded hillsides with “No Trespassing” signs at the driveway, others laid out alongside barns and white graveled drives. The valley and its waterway curl under the dominating rise of these northern slopes of the Boston Mountains. Here and there ancient landslides or silted bends form little meadows suitable for a house, a garden, even pasture. I drive along watching the land slowly rise as I pass further south. I think of pioneers who claimed these places as their own, the long process of clearing fields to plant their wheat, corn, oats, cotton, and tobacco. I think of their log cabins, the children they raised, perhaps descendants living here still. I’m immersed in the past when travel through places that required heavy wagons pulled by mules or a faithful horse to pick its way across the rugged land. I think of the millennia before white men, when Natives crept through the underbrush watching buffalo herds graze. I think of the millions of years it has taken this tiny place on our planet to form, primeval seas that covered the land then receded, the rush of glacial melt carving its way through countless layers of primordial continent with its fossils of all that came before. Finally the road and creek bed approach the same level. I could stop, walk past a broken down fence line, and wade. I could sit and watch the water sparkle in sunlight as it rushes along its path. I round a last curve and stop mid-breath. My heart leaps into my throat. A surreal scene spreads across the narrow valley. My mouth falls open in shock. I’m instantly transported to a science fiction world. It’s almost more than I can take in. 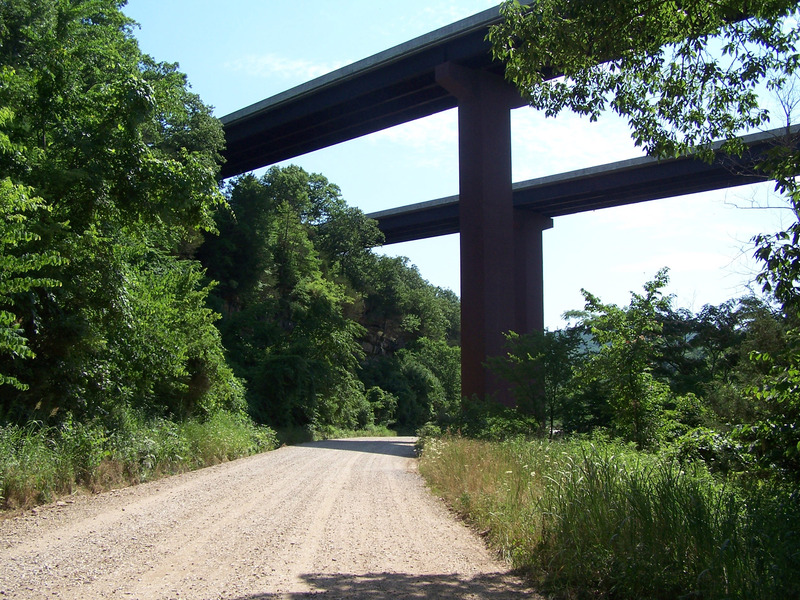 There, straddling the stream and rising so high I must lean forward to see the top, are massive square steel pillars that hold up Interstate 49. 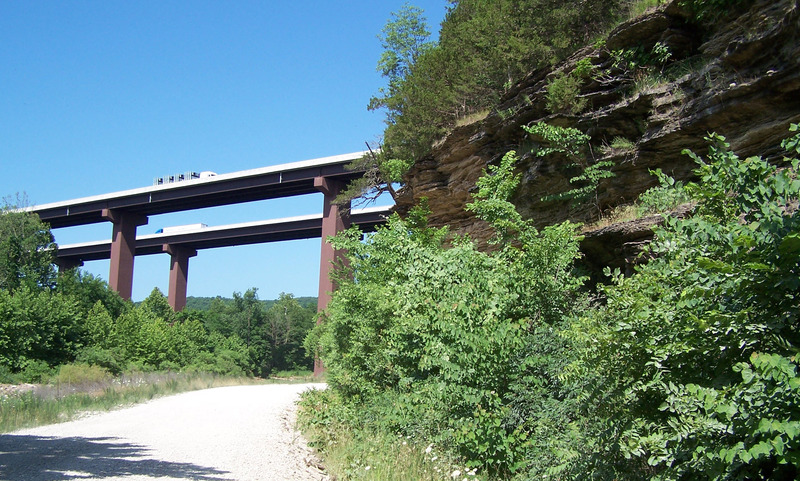 The juxtaposition of the interstate and its structural supports against the backdrop of this venerable wild landscape is almost too much to absorb. I stop, take pictures, try to come to terms with this bizarre reality. I examine the way the highway engineers planned to use the upper canyon wall as a launching pad for the roadway to fly across this valley. I study the exposed layers of earth and stone cut over countless eons by this now-trivial stream, laid bare as if pages of a book waiting to be read. Not so trivial, even now, it seems. Evidence of raging flood mark the edge of the roadway, grass twisted and brown with silt, knots of weed tangled in fences. I think of Zadock Winn who believed he could cross even though the water foamed and seethed in its torrent. I thought of how, in all things, Nature will always win. She will win here, too. For now, traffic clatters and roars far above my head, the steady drumming of tires, the regular lub-dub lub-dub as one after another vehicle crosses each section. Some bracing rattles more loudly than others, perhaps already loosening from its original moorings. There is no peace in this valley. I drive on. 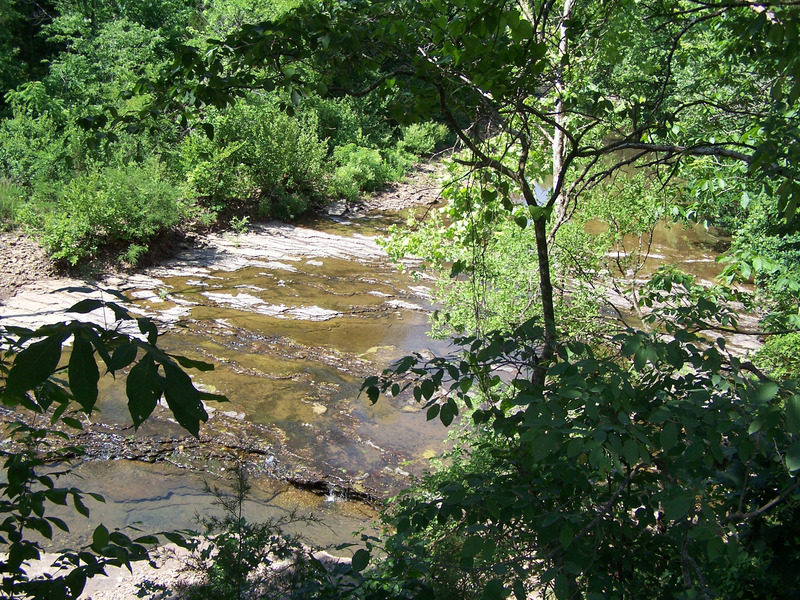 Another quarter mile up the road, the creek takes a ninety-degree bend, providing me the fullest view of its intrinsic beauty. I peer down from the road where it hugs the hillside forty feet above the water. This is the widest point of its course, ornamented in sparkling ridges as layer upon layer of rock gradually step down through the curve. I can almost hear children laughing as they splash and play in the shallow cool water. Ahead, if I ventured another three miles or so, I’d arrive at Highway 74 where a left turn would take me to Winslow or a right turn would drop me into the wonderland of Devil’s Den State Park. I turn around and go back the way I came. I drive home slowly, jarred from my normal frame of mind. The experience of that creek and its valley remains an arresting memory I won’t soon forget. It compares with the best stories I’ve seen or read where astonishing realities intersect with the commonplace. 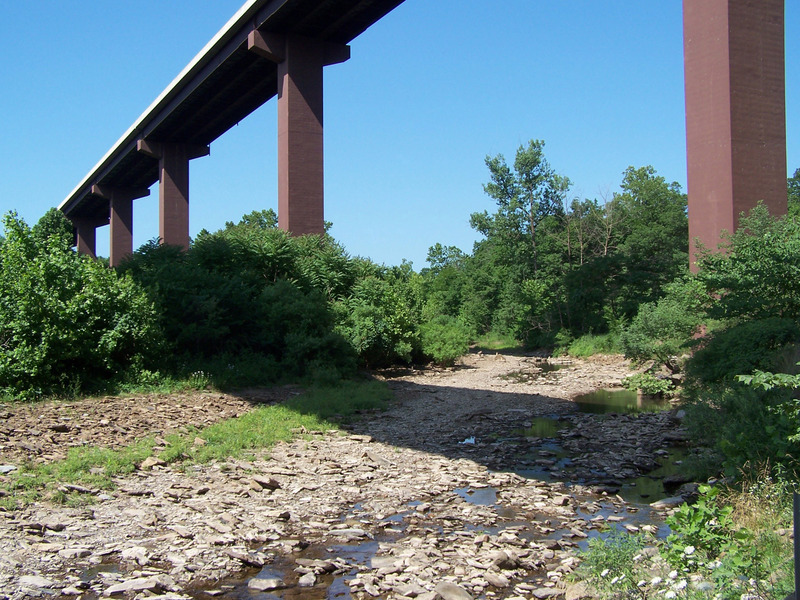 The interstate and its undergirding simply do not belong in that landscape. Yet I’m twenty plus years past any of this being new. Surely the people who lived here during construction grew familiar with the mind-boggling scale of the interstate’s design. Surely the workers laboring day after day through the pouring of concrete and operation of massive cranes to erect these towers saw their labor as being rooted in the ground. It is rooted in the ground. No doubt the foundations for these support towers are driven deep into the strata far below the creek bed. 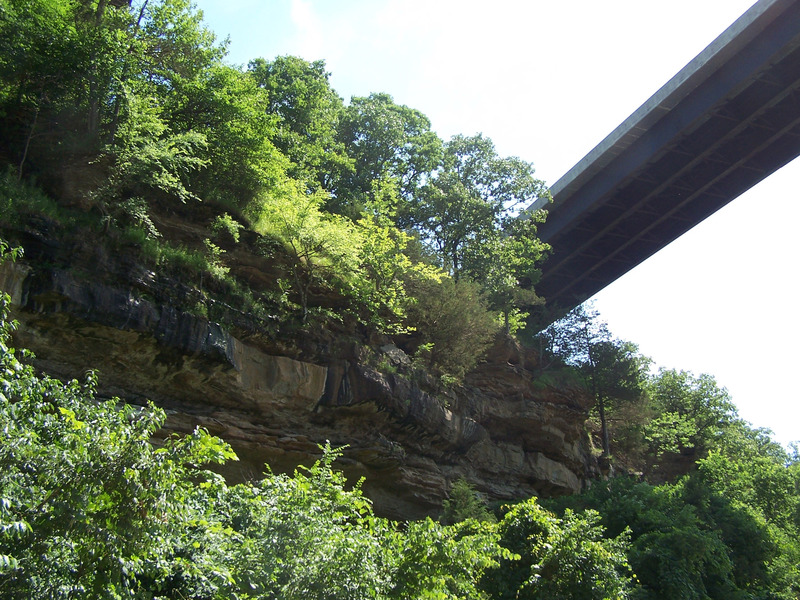 I wonder how long it will stand, this high-flying roadway built to accommodate a life lived too fast for contemplation of creek bottoms and tumbled rocks. How many decades will these pillars remain? I imagine a future time when only the towers still stand, the path for vehicles long since rusted and crumbled by the forces of weather, traffic, and time. How much of the concrete will fall to this scenic valley? What will it look like here in a hundred years, a mere blink in geologic time? I’m disappointed in my words and even the photographs to adequately describe my visceral experience of this location. It’s worth the drive to put yourself there, to stand staring up at the work of man while surrounded by the work of Nature. Questions of time, space, and existence arise spontaneously. Of our place in the continuum, of what the future might hold. 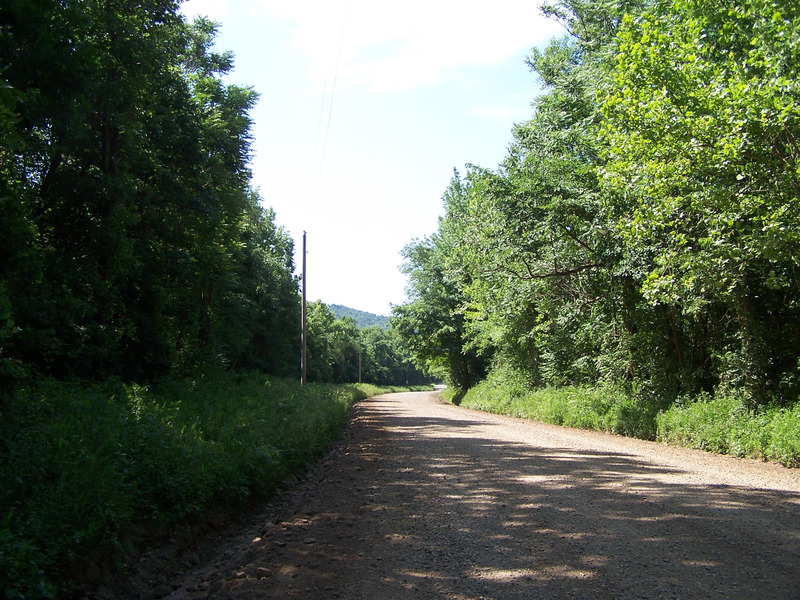 This entry was posted in American Culture, Human History, Local History, Rural Living and tagged canyons, creeks, Devil's Den, dirt roads, flood, highway, I-49, Washington County Arkansas, Winn Creek Road, Winslow, Woolsey on June 17, 2018 by Denele Campbell.